Monroe Construction, Inc. began over 30 years ago with a focus on all phases of general construction in both commercial and residential sectors. In the early 1980’s, the company turned its attentions away from residential construction to more complex commercial projects. Our course has remained steady and our portfolio of expertise has grown. Learn more about the industries and specializations of Monroe Construction. 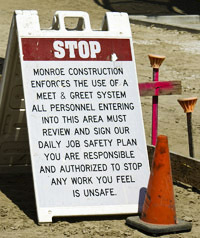 Monroe Construction has a comprehensive safety policy that is regularly reviewed and updated to comply with new legislation and requirements. All staff is trained on how to protect themselves, our customers and the general public. Technicians are OSHA trained, certified on the safe operation of specialized equipment and working within sensitive construction environments. Procurement professionals looking to grow a diverse, supplier network will be pleased to know that Monroe Construction, Inc. is a certified Woman-Owned Business. Our company is proud to be certified by Women's Business Enterprise National Council (WBENC) and The Supplier Clearinghouse.